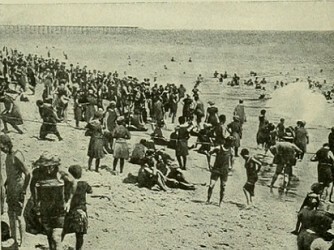 pennsylvania railroad co.: forty beaches of new jersey, 1915. Forty Beaches, Highland and Water Resorts. Photographs of surf-bathing on the New Jersey coast, the highlight the brightly coloured cover illustration (below). THE greatest pleasure resort section in the world is the wonderful stretch of beach and inlet along the coast line of New Jersey from Cape May lo Long Branch. Its forty different centers are visited year after year by thousands of persons in search of health and recreation. Nature has divided this playground into three sections, alike in thheir appeal to the pleasure and health seeker, but differing in the physical characteristics of the resorts and the surrounding territory. 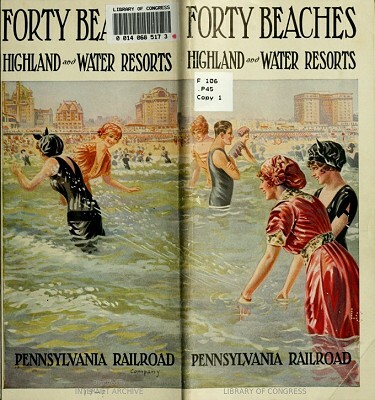 Geoff Cater (2017) : Pennsylvania Railroad Co. : Forty Beaches of New Jersey, 1915.